Ce document au format PDF 1.5 a été généré par Microsoft® Word 2016, et a été envoyé sur fichier-pdf.fr le 28/04/2017 à 16:16, depuis l'adresse IP 196.201.x.x. La présente page de téléchargement du fichier a été vue 244 fois. Taille du document: 112 Ko (3 pages). 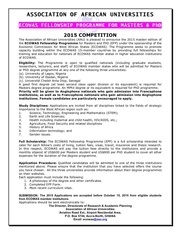 e-Learning)”; “Leadership in Global Education” and “Girl’s Education”. approved in 38 C/5 and in accordance with the decision made by the Executive Board. curriculum, school/class management and teacher’s training). must be made on a UNESCO fellowship application form. The implementing agency in the Republic of Korea will be the KOICA/APCEIU. mentioned above, will not be taken into consideration. International Understanding (APCEIU) in the evaluation of these dossiers. 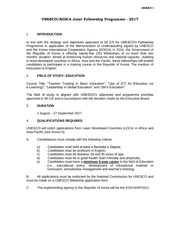 KOICA/APCEIU/Permanent Delegation of the Republic of Korea to UNESCO. the donor government has not approved their applications. 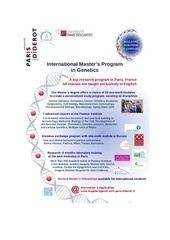 study director that will be provided by the host institution. amount of the stipend to be granted to beneficiaries. 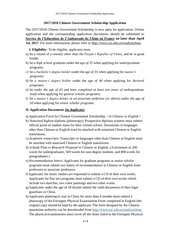 per fellow, and will pay a one-time travel allowance amounting to US$ 200 per fellow. No provision to finance or lodge fellows’ family members can be made. director. A copy of this report will be sent to the KOICA/APCEIU. Ce fichier a été mis en ligne par un utilisateur du site. 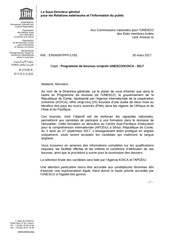 Identifiant unique du document: 00508113.